hey, what are these things? It was COLD again today. And WINDY. I think it was the wind that was so awful. One of the sap buckets actually got blown off the tree, no kidding. Steve saw it on his way to work and stopped to put it back. Had he not, it probably would have rolled all the way down to the stream at the bottom of the hill! With the deep freeze again today (it did finally get up to 33, but never felt above about 15) the trees weren't putting out nearly as much sap as yesterday. A couple of the taps are really slow anyway. Two of them were frozen again, all day today. Interesting to me that some would be frozen and some would not. Anyway, I'm guessing only about 2 gallons of sap collected today, as opposed to about 5 yesterday. And I really should be getting more like 9-10... but it has been cold except for yesterday, which was gloriously like spring. And, they are talking about that four letter word that starts with "S" again for Saturday. Yep, snow. Or freezing rain, which is almost worse. Well, to lift my spirits, I seeded a few more starts for the garden, and since I can't plant directly in the cold frames because the ground in there is still frozen, I am trying putting some things in containers. These are all cold hardy varieties, and even though the ground is cold in there, the air temps have been warm - yesterday it was nearly 80 degrees in there! 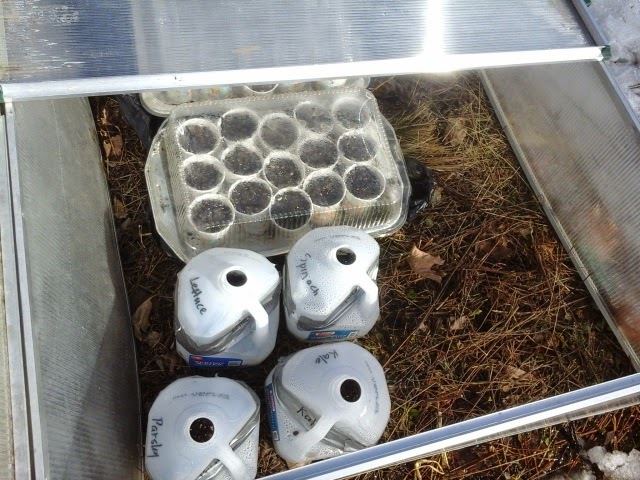 Soil temps are more important than air temps for sprouting seeds, but my hope is that the containers will stay warm enough to let a few things sprout. I did this two ways. One, just in the cups I use to start seeds indoors, for the really cold hardier things like spinach and lettuce and mache. And, two, in some empty gallon water jugs, which should create a sort of greenhouse effect. 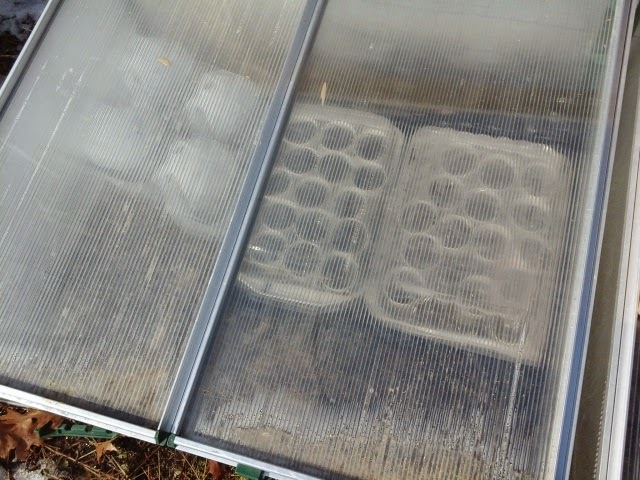 Double that with being inside the cold frame, and maybe it will be warm enough to let things sprout. We will see! 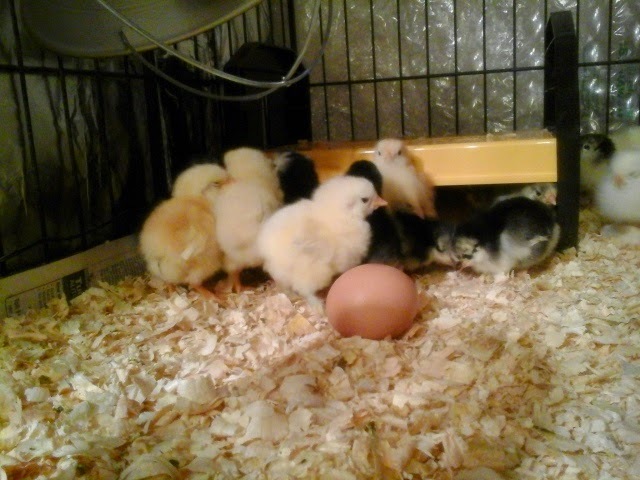 The chicks are all doing very well. They were much more active today, and lots of eating and drinking and pooping. As a way of measuring the rate of growth, I will take a picture of them next to an egg every day or so, so you can see how rapidly they are developing. Chick and egg at Four days. Some links for chicken breed info.